Due to the market penetration of smartphones and tablets, the demand to be able to perform banking transactions via mobile devices increases. The implementation of mobile banking solutions is based on apps. (For each target platform a specific application is offered to download in the store of the hardware supplier). Seal One AG provides you with a strong 2 factor authentication directly on your smartphone or tablet. Simple and intuitive operation, signing using your fingerprint. 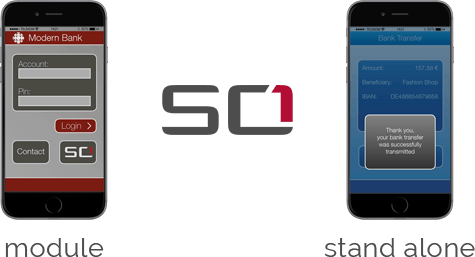 The Seal One app will be offered either as a standalone app or as a module for easy integration into the existing mobile apps of the acceptance partner.